My mom used to put a night light in our bathroom when I was little. It was a ceramic house with Victorian windows and snow-covered roofs. It was such a pretty sight, aglow in the dark, and I was fascinated by it. Maybe because when you’re wide-awake at two in the morning as a seven-year old, the light from the hallway bathroom is the most interesting thing in the house. But probably also because that quaint little house looked so out of place in my bathroom. Something so elegant, so fairy-like, shouldn’t be sitting next to my toothbrush. I would stare into the light and imagine beautiful parties or cozy family dinners in that little house. I wanted to be there. I wanted to be on the street outside its front door, in that winter wonderland, in whatever world its from, far, far away. Let’s fast-forward to the last two days of January 2015. I’m sitting on a bus that bounces down a familiar road from Prague to Liberec to visit some friends. As we rise in elevation, the fields outside go from brown to winter green to white. It’s snowing in Liberec when I step off the bus onto the cobblestone of the city’s transit center. My friends are waiting for me – both blond-haired and blue-eyed. Twins. We say our ‘hello’s and I dance around merrily, delighted by the weather. Then we march off toward our destination: the city pool. It’s snowing lightly as we slip across the stones and sidewalks. If you’re an American reading this, I can promise you that you’d think the distance we walked just to get to this pool was outrageous. Honestly, it feels pretty normal to me now. Europeans walk everywhere. Czechs do public pools differently than Americans. There is a whole sanitation and pre-swimming washing ritual that is religiously upheld. You wade through foot pools between each room to keep the dirt out, shower before entering the pool area, and get blasted by waterjets as a final measure of cleanliness before you can enter the deck. But it’s worth it. There are water slides and toboggan runs like those you find at aquaparks. There are multiple spas and diving boards and a power-generated river that sweeps swimmers outside (into the snow) in a steamy current. And then, of course, there’s the massive pool in the middle of it all. “This is the largest pool of its kind in Central Europe,” explains the twins’ mom who has joined us at the poolside. I believe it. Eventually, we go back through all the shower jets and water pools to get to the lockers and then it’s into the cold January afternoon again. Lunch time. “Do you want to take the bus back?” asks the sister. The mom has gone ahead and the brother is still somewhere in the men’s lockers. “I don’t mind walking,” I say. So we trek. It’s a hike through slushy streets and park walks and snow-capped hills dappled with laughing children tumbling off plastic sleds. We talk about names of birds and animals, tripping over the language barrier as frequently as we slip on the frozen path. Lunch is hot and waiting when the elevator doors drop us off on the fifth floor outside their flat. The kitchen table is set right against a large window that looks out over the town as it winds its way into the foothills of the mountain. My breath completely escapes me. It looks like a snowglobe in the frame of the window. Thick flakes whirl outside, frosting sea-green and candy-red rooftops. A church steeple lifts above the sleepy homes that sink into the forests climbing the mountain. 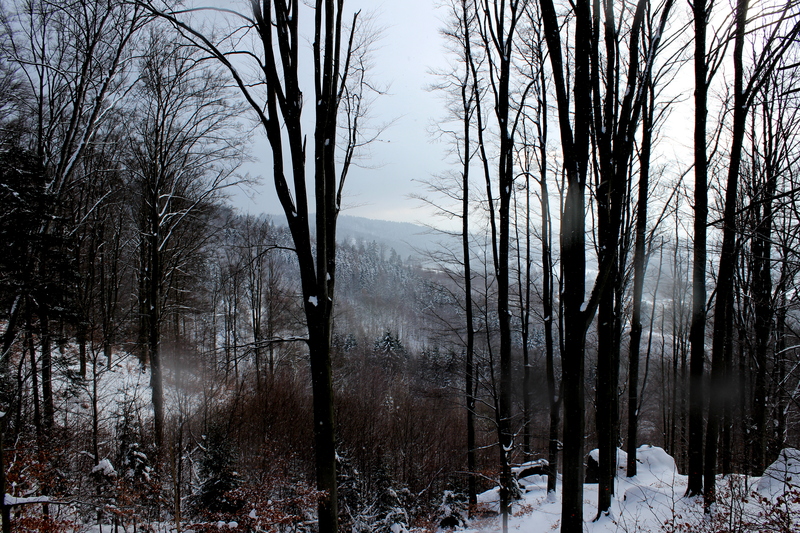 Everything is dusted with sugar-white snow and pressed against a pale grey sky. I spend all of lunch just looking out that window. We go to a tea house when the dishes are cleared and whittle away the rest of the afternoon playing cards games and sipping special brews from china cups. It is dark when we re-enter the apartment. A movie and then bed. After all the swimming and all the walking, I fall asleep right away. We wake up to sunshine – a rare treat this time of year. The sky is bright blue and soft as a bird’s feather. The view from the front window is indeed breathtaking. With clouds out of the way, the lookout tower is clearly visible on top of Ještěd, a mountain that looks like the flank of a sleeping dragon. The lookout tower, dressed in crystal and icicles, could just as easily be a fairy palace. It seems out of place above the sprawling apartment complexes below – it should belong in the clouds. Breakfast consists of bread with cheese and meat spreads, apple strudel and hot tea. 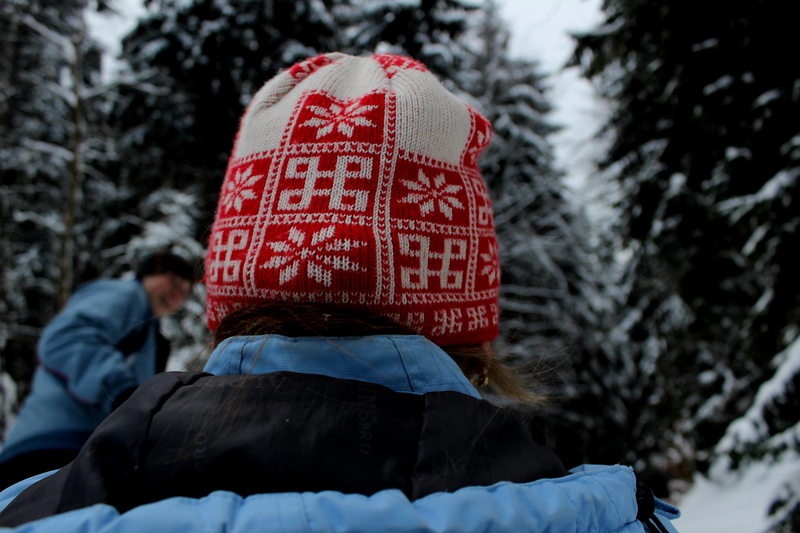 We bundle up, pulling out snowshoes and pants, scarves and hats and gloves. The elevator takes us and our two wooden sleighs to the bottom floor where we make our way outside, across the town, to the bus leaving for the mountains. It’s a jolly bus, packed entirely with skiers and sledders (and their dogs). Everyone is in a good mood, even those of us forced to stand in the isle. The bus driver is playing a mesh of classic American folk music and Czech bluegrass, the latter of which is a special kind of joy that I only discovered just last year. There is even more snow carpeting the ground up here in the collar of the mountain. 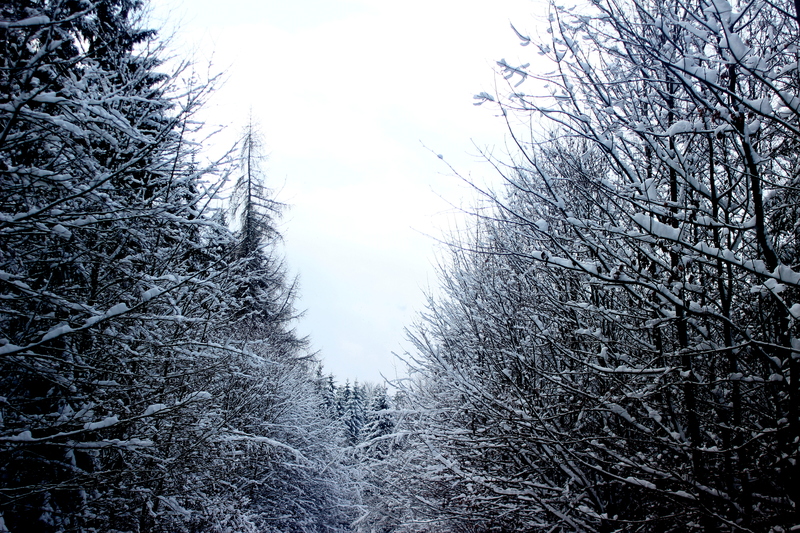 Sledding the hills and walking the straights, we set down a path in the middle of an enchanted, snow-flaked forest. Every tree branch looks like a sugar cookie that has been piled with too much icing. The snow crunches – actually crunches – beneath my feet. Downhill isn’t as easy a path as one might expect, mostly because sledding isn’t as easy as one might expect. Lots of overturned rides, lots of wet grins and frosty giggles. Lots of snowflakes. They look like fairies, they really do. So delicate and precise, their swift dance through the woods around us, I can almost see their glowing faces and silver wings. We reach the bottom of the mountain in about an hour and a half. 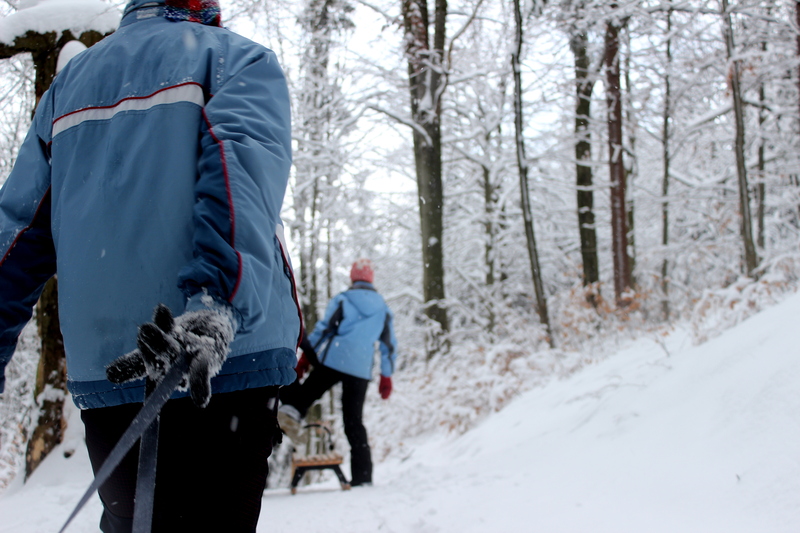 Then we pick up our sleds and walk – walk – all the way back to the house. Just below the path we’ve left is a botanical garden and a zoo. We can see the elephants in the corner of their enclosure, keeping each other warm. It looks so odd to see elephants in the snow and I wonder how well their leathery skin keeps them warm. As we drag our sleds through the town we turn into an older neighborhood, nestled along the ridge of the mountain steps. All the houses loom over us as we patter down the cobblestone street. Built at the turn-of-the-century, they have all the trappings of the once-wealthy, aristocratic life. Many of them have not been well kept up, but some still have deep blue trims and tiles or ivy growing in heart-shaped patterns around red-framed windows. And they are all covered in snow. I can almost hear the sound of music and laughter from balls and dinner parties that must have happened in those homes a century ago. It feels strange to be standing right outside them, like walking below giants that have been frozen in time. They look like gingerbread houses. No, they look like my nightlight. The apartment comes into view and I can almost smell the lunch that is waiting for us. In those final steps home, I think about how strange it is that we spend so much time trying to fit in when the most beautiful things in the world are the things that stand out. I think it’s okay to march to the beat of a different drum. In fact, I think that’s what we’re called to do. As Christians in a world where most people will fundamentally not understand our perspective on living, we must look a bit like elephants in the snow. But I’m okay with people gawking through the cracks at me if it also means that they’re reminded of some place warmer. I’d be honored to be the mountain tower that people see and think of heaven, even if it means feeling out of place on earth. I don’t mind sitting next to the toothbrushes if I can be a light for someone in the dark. 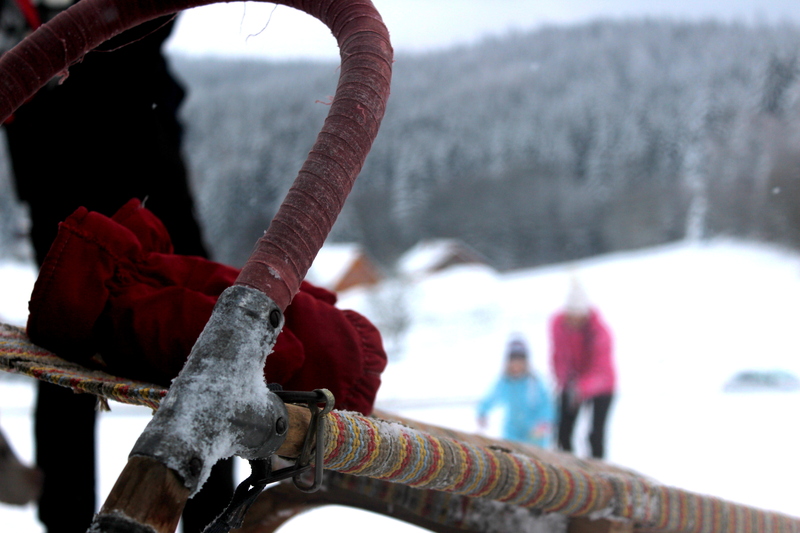 This entry was tagged Christian life, Czech Republic, faith, Liberec, life, light to the world, sledding, snow, travel, winter sports. Bookmark the permalink.